Cast a comforting glow into your child’s bedroom with Tinkerbell string lights. Perfect for use as a night light, your child will benefit from comforting soft lighting and the familiar characters of Tink and her fairy friends. 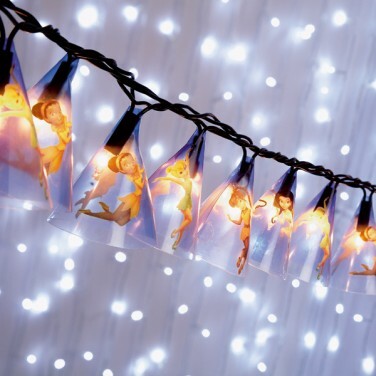 The magic of fairies is captured on a string of 20 cone string lights featuring Disney’s Tinkerbell and her friends. String the fairy lights around your child’s bedroom to add a touch of girly glamour whilst providing a comforting night light. Just add fairy dust for a perfect nights sleep!